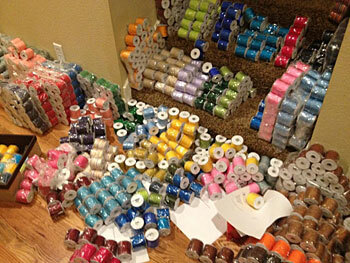 Just in lots of new colors, and stock back in including lost of Black spools. 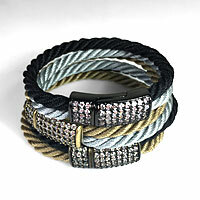 We are reordering and adding new colors as often as possible. 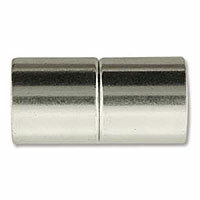 Here is what's new: We just got more 0.4 mm Size NewE colors and stock in. 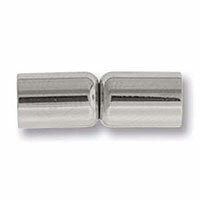 Also more 0.8 mm NewFine and 1.5 mm HDQ (High Density Quality) stock in. 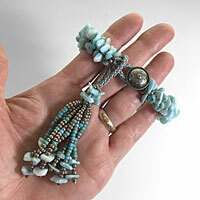 + Coming soon more stock of Size E, plus more Tibetan Buddhist 5 Color Cords with metallic thread. 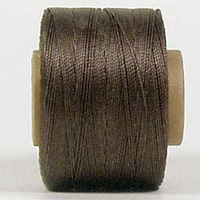 Conso Nylon #18 3 spools of 756-Brown in 2 dyelot, 10 spools of 751-Beige in 3 dye lots, 25 spools of 773-Dk Green, 5 spools of 770-Leaf available HERE. 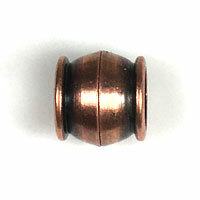 Plus 9 spools of Vintage Mastex 756-Chestnut available HERE. We are making these kits as quickly as we can. 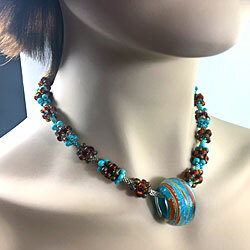 We just made more Taos, Golden Berries and just found ready made Blue & Tan ribbon, so wewe will have more available as soon as we make more bead packages. 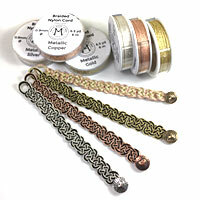 Golden Berries and Blue & Tan are featured here with focal knots. 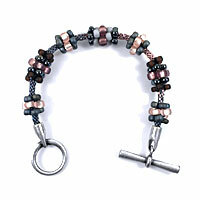 Make a bracelet and a necklace with fiber segments and bead clusters, a 'best of both world' kumihimo design. 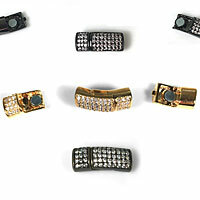 The instructions have just been completely re-written, re-thought, and now come with new design options. 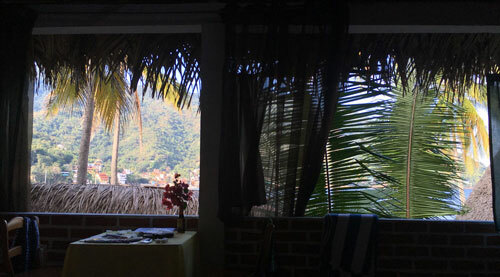 The step by step instructions with over 40 pictures make this project easy. 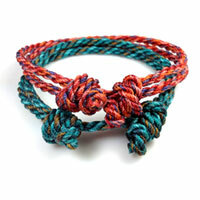 Hey, this is exciting, I found a new supplier and master dyer of this rayon knit ribbon. My previous supplier closed their business a while ago, so this is really great news. 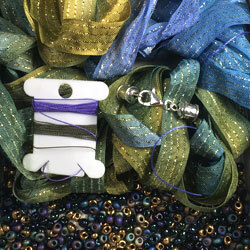 This is the ribbon used for the Kumihimo Bead Cluster Bracelet & Necklace Kit. 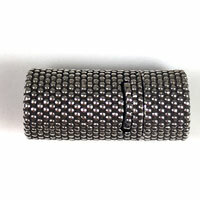 It can of course be used for knitting and crochet. 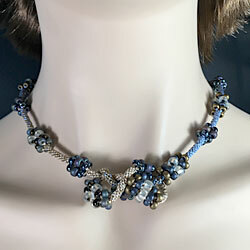 It is the yarn recommended for the 'Twilight" knitted necklace in Betsy Bead, the book by Betsy Hershberg. 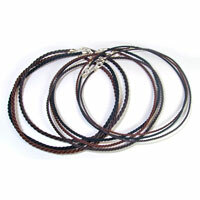 Perfect for leather wrap bracelets for the holidays or anytime you want a metallic accent. 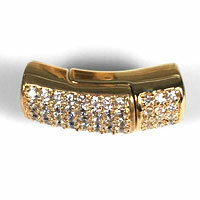 Available in Antique Silver and Gold. This leather is from China but it compares well in quality with Greek leather. 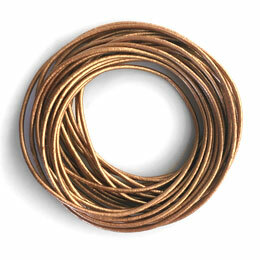 Crochet with this cord available in Metallic Copper, Gold and Silver... 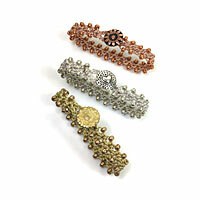 These bracelets are made with Miyuki Seed Beads Size 6 and Metal Shank Buttons. 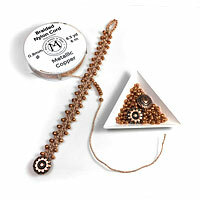 The cord, bead and button kits have enough materials to make 2 bracelets. Just in. 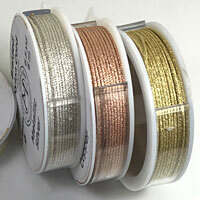 0.9mm Metallic Braided Nylon Cord, available in Metallic Silver, Metallic Copper, and Metallic Gold. 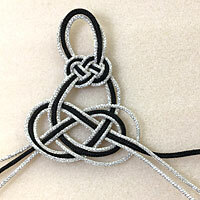 This cord is strong, and it can be knotted, braided, added to kumihimo as a metallic accent, its ends can be melted. 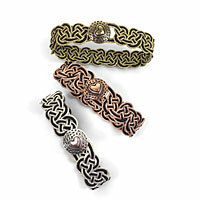 It can be washed, it dries quickly... and it can be knotted into these New Celtic Bracelets. 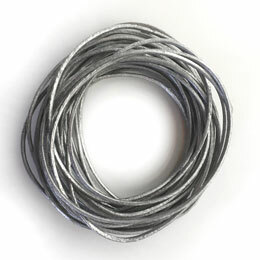 2-ply, 3-ply and 3-ply cord making just got a major updates. The tutorial now includes 3 projects and some brand new techniques well worth learning about. 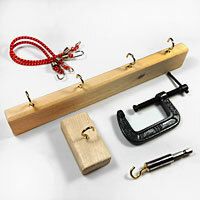 The tutorial can be bought by itself or with the tool set. All the colors have been added, and while we did that we found some extra cards that had never been added in due to their limited quantities available. 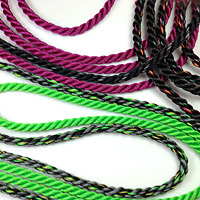 Wow, now 46 solid and variegated colors are available. 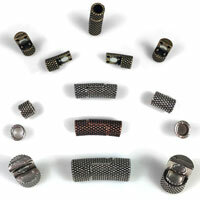 Finding the right clasp for kumihimo projects is often difficult. 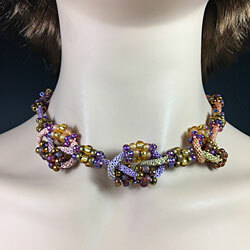 Planning ahead is the best way to go as the clasp needs to be part of the design process right from the beginning, not an afterthought, so check out our new clasps and get instructions on the best way to attach the clasps to braid and cords HERE. The Dot Collection from the EU has 5mm round inside diameter clasps, plus 5mm sliders in three metal finishes, antique silver, antique copper and antique brass, plus one 8mm clasp in antique silver. 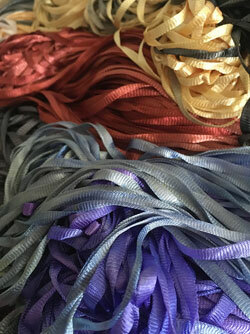 We just received a large box full of 100% Nylon Ribbon. 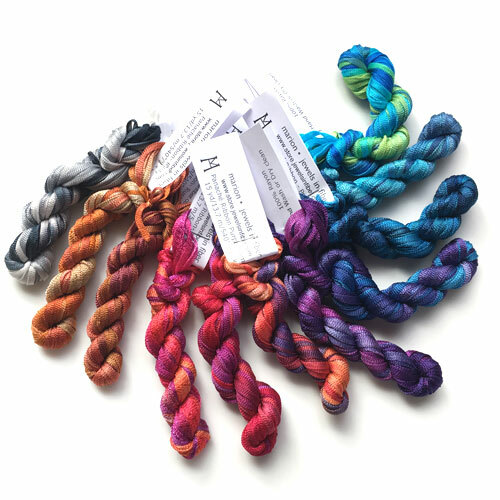 A few skeins already have been photographed and transferred to cards. 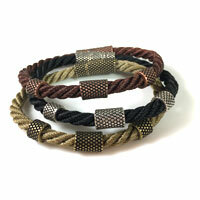 Check out the new colors and keep visiting as we add more colors in. I will let you know when this batch has been fully added. 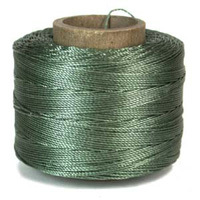 I also have a new kumihimo neckpiece project in the works with this nylon. We will keep you posted on all fronts. We just found 2 skeins hidden away in a drawer. 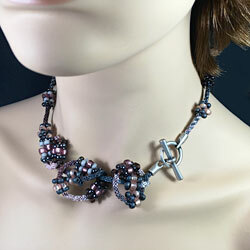 This hand dyed rayon ribbon with metallic accent is no longer available. 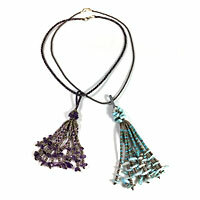 We made these kits with a double skein length, so you will be able to make a super long braided necklace with this kit. 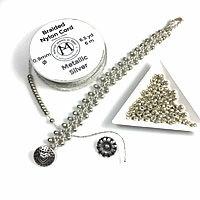 One of my customer send me a picture of a double braided neckpiece she made with this kit. It is gorgeous. 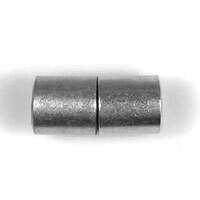 Making a necklace and bracelet os also a possibility. I keep collecting more buttons... A NEW tag is marked by their names.